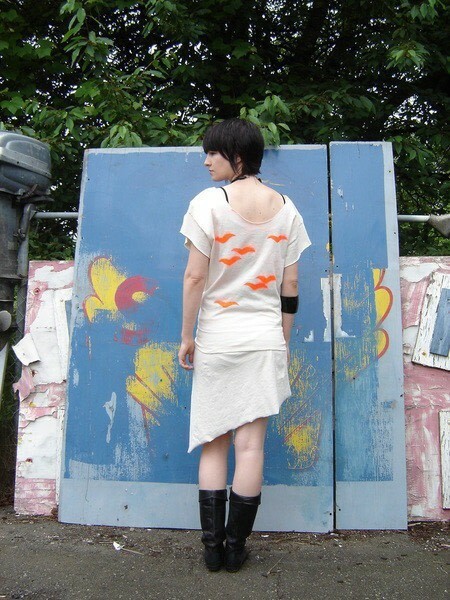 Two T-shirts, a pair of scissors, one can of spraypaint = One comfy, cool dress to go dancing in! 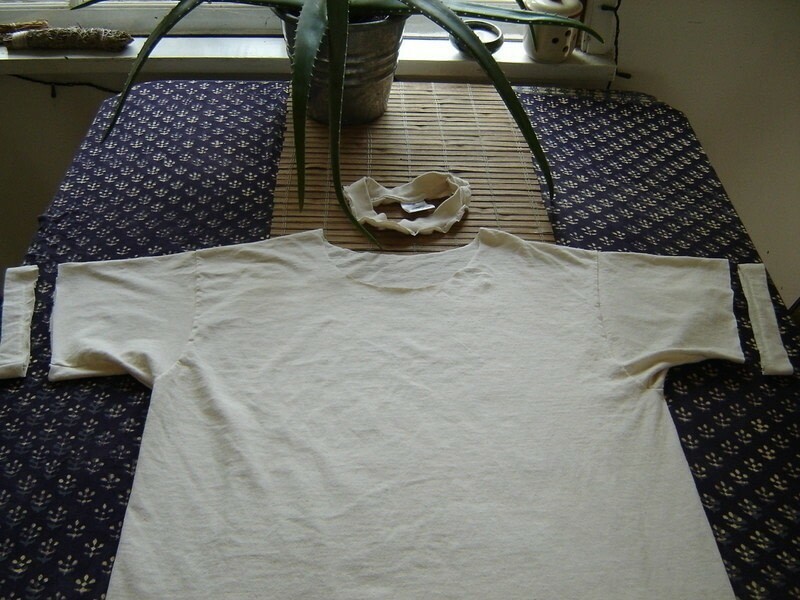 One large unbleached cotton t-shirt to make the top: sleeves trimmed of their edges, neck cut out, and laid flat. 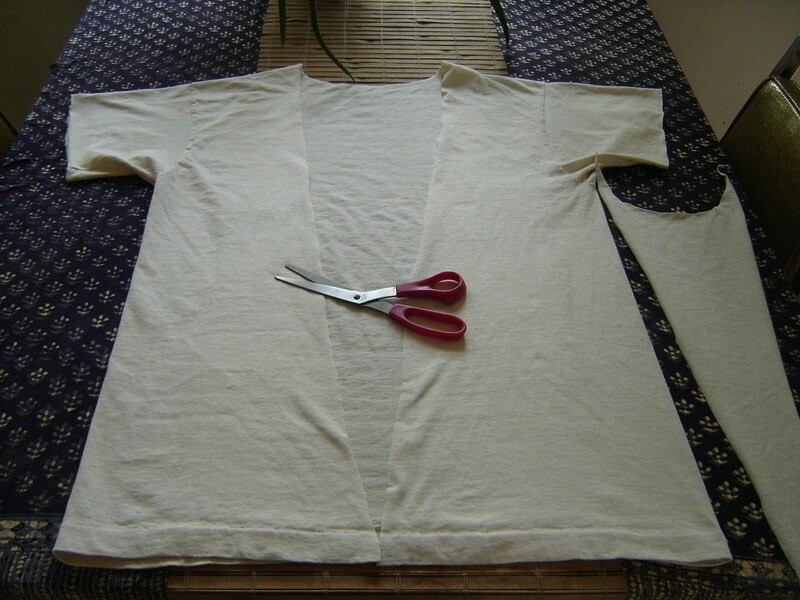 Now cut a deep-V, starting from the bottom edge (right square in the middle of the t-shirt) to each side of the neck hole. 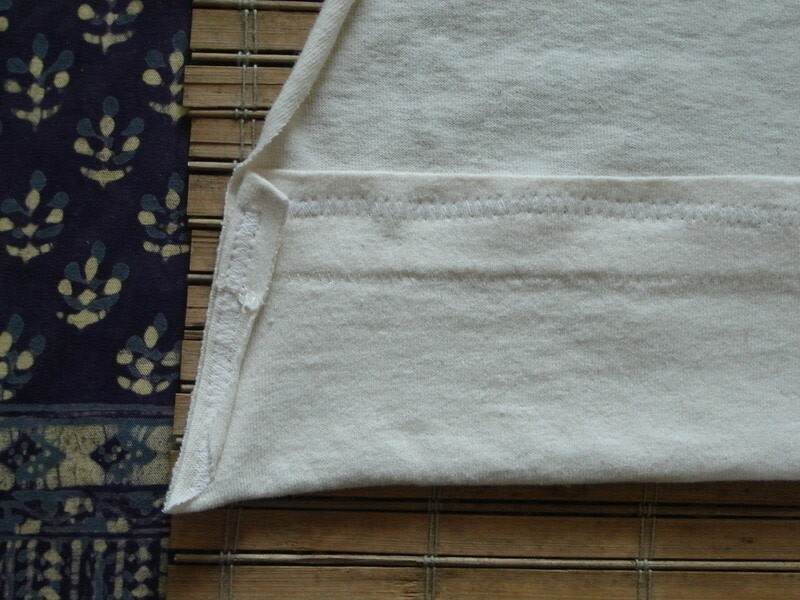 You end up with a V-shaped piece of fabric you can toss into your scrap pile for use later (right side of photo). Once you line up the whole hem from left to right (separated down the middle now because of the V), the bottom is folded up about 3.5" and sewn along the top of the fold with a zigzag stitch on the machine. 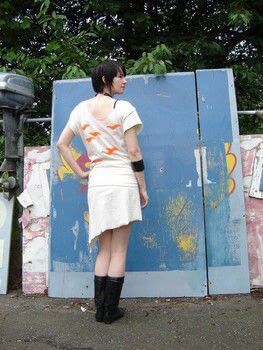 Now you're free to make a very simple stencil (I used an exacto knife to cut out the bird-shape into a slab of cardboard) and spray to your heart's content! I used cheap acrylic florist's spray, and it's probably not water-proof, but this was my first project of this nature, so who cares! Let dry several hours. The skirt consists of another large unbleached cotton t-shirt that has been chopped up, and wrapped around the hips, and secured with a safety pin. I got it out of "108 ways to cut up your t-shirt" (I *think* that's the name of the book...hehe..) but you can experiment! These two pieces can be easily worn together, or separately. The top is also reversable, and is dead cute with skinny jeans and slouchy boots too! It's extremely comfortable, and flattering. 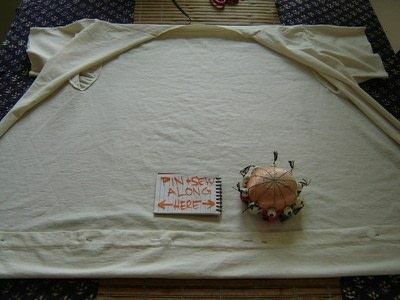 I only did the top part, and cut up the back instead of the front and wore it backwards. I didn't sew it, but I just rolled the hem up a bit and secured it with safety pins and it still looks fab! Thanks for the idea! I love it! Can you clarify the last two steps please? Photos?